I was greatly concerned because I am a firm believer that the more pages Google has indexed for your website the better for overall search ranking and SEO. To see a drop like this is almost scary. For those wondering, the drop happened during the week of 8/23/15. After doing a little bit of research I found out that all the websites I monitor in Google Webmaster Tools saw a significant drop. I would imagine this is some type of bug and will do nothing to hurt your search rankings. That said, this is an opportunity for me to tell you to continue to publish more and more content. There is a reason Amazon and Wikipedia rank so very well in search. These web properties rank very well because they have millions of pages indexed and hundreds of thousands of those pages are receiving links every single day. If you ever want to get more search traffic and, ultimately, more business from your website start publishing more content. 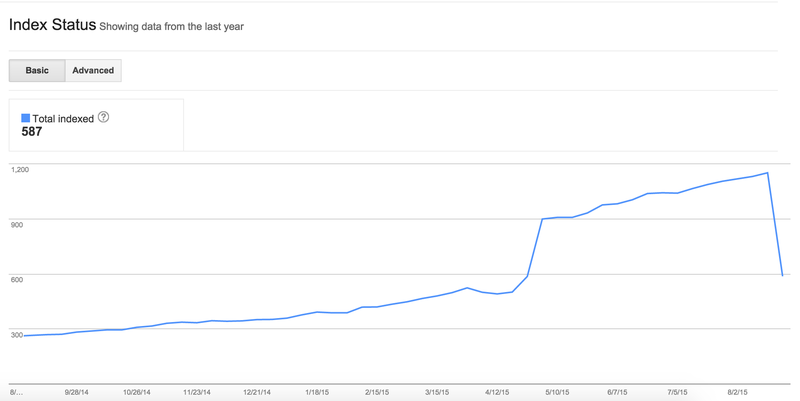 Do not fear a drop in index status in the Google Search Console right now. I am positive this is just a bug and it will be fixed within the next few weeks. Something I would suggest doing is going to Google and typing in site:[yourwebsite.com] and seeing how you fare versus your competitors. If your major competitor has 10,000 pages indexed in Google and you only have 400 pages indexed you can be rest assured they are getting much more search traffic, and business, than you are. The same situation in our network of sites. Yes, the same problem happened to my website, and I believe that there is google alogrithm change again.